She is an adult, married, with a young son. She is a writer, living in New York, with deadlines and assignments. Her place in life is already carved out and understood. For Dani Shapiro, her memoir embraces the fact that she actually doesn't know, but that she is trying - trying so very, very hard - to find out. Most especially, faith becomes the crucial piece that perhaps will help make sense of it all, to calm her anxiety and the fear that something bad could happen at any moment. Faith, though, has almost disappeared in her adult life, which is the most troubling. The uneasy feeling of being an outsider in the very religion you were raised in is undeniably unsettling. She wonders how it is possible that she doesn't remember Jewish hymns and prayers that she grew up hearing and reciting herself - how can this be so? The doubt and fear become the wall, separating her from some semblance of personal foundation. 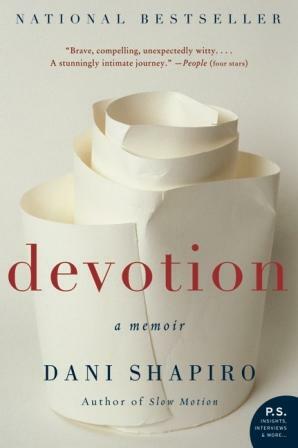 This beautifully written memoir is a quiet undertaking, an introspective study into understanding meaning and religion, if only to feel a connection to her deeply religious father or to repair the relationship with her mother - maybe, actually, even to God. And I could not put it down. Weaving elements of different faiths, yoga, Kripalu, her search is a lyrical unfolding of personal stories, snippets of contemplation, short pages of confusion, heartbreak, and understanding. Dani Shapiro's path evoked a sense of my own questions of faith - where was I to fit myself in the great landscape of life? Reading it in a few hours was a simple journey for a similar door to open a bit more, and understand personal faith. I know that this will fit perfectly on my bookshelf, a comforting reference point. One person's life can't possibly provide all of the answers another hopes for, but it can certainly offer a bit of comfort to know that you're not the only one moving about and trying to make sense of it all. This is my first time reading Dani Shapiro's work and I kick myself for not having read her other books sooner. Although I'm sure this will be recommended mostly for women, I would recommend this to anyone who has pursued their own questions of life and faith, and their place in all of it. Book clubs - this is definitely one to pick! I enthusiastically encourage you to select this for your next meeting - there is no question that it will evoke thoughtful discussions and personal stories. 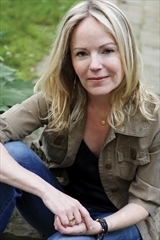 Dani Shapiro will also be available to Skype with your book club! Click here to find out more. Dani Shapior's most recent books include the novels Black & White and Family History and the bestselling memoir Slow Motion. Her short stories and essays have appeared in the New Yorker, Granta, Tin House, Elle, Vogue, Ploughshares, and O, The Oprah Magazine, among other publications. She livers with her husband and son in Litchfield County, Connecticut. Wednesday, February 9th: Kelly’s Lucky You! Thursday, February 10th: Book Club Classics! Lovely review! I'd never heard of Shapiro so thanks for the heads up. I was blown away by this book! Really resonated for me and gave me so much to think about. Everyone's spiritual journey is different, but still, reading about it must make you think about your own situation. I was pretty wayward until I met my husband, and we decided we wanted to raise our kids in a unified household. It just feels right, you know? They say that Jesus is present whenever people are gathered in His name, which is so true. Community is everything. This sounds so good. I think almost everyone struggles with their faith at some point in their life, so most people could relate to parts of this book. Chelle - It's a wonderful book, do let me know if you read it! Booksnyc - I'm so glad you enjoyed it! I absolutely loved it and would recommend it to everyone! Sandy - You are spot on - everyone's journey is different and reading about someone else's only enhances your own experience. And I think a unified household makes perfect sense, and is beautiful to recognize all faiths! I wholeheartedly agree - community is everything. bermudaonion- Kathy, I agree. Struggling with faith is pretty consistent for most people, just in varying degrees. This book is definitely relatable and I'd recommend it for everyone! Wooooo. My interest is SO piqued right now. I've been on some sort of spiritual quest since I was 15 and 13 years later I still have more questions than answers, although a few options have admittedly been firmly ruled out. I'll definitely be keeping my eye out for this one and will write it down for future book club suggestions. Thanks for this great review! I haven't heard of this, but it sounds really interesting. I will check it out! It sounds like the author has had some really tremendous spiritual insights over the course of her life, and even though I have my faith "on straight" so to speak, I think it would be really interesting to read her reflections about her own journey. Thanks for the excellent and sensitive review, Natalie! Sounds like it's pretty good. I might have to give it a read. Oh I agree - book clubs would likely get a great conversation out of this! And I love that you suggest that men read it as well. It seems to be a book for anyone who has questioned their own faith and place in the world. I've really been enjoying memoirs lately. I look forward to adding this to my list to read. I don't read a lot of memoirs but this one sounds good! That is SO awesome that you read SB too and everything!! I am starting another blog about vegetarianism/veganism too but Im not done making it yet. I bounce back and forth too. To me being vegan is the ideal but I feel too deprived and when I feel deprived I binge eat so Ive found a really good balance with a mostly vegan diet. :) What is your vegan blog's web address? So funny, I was just reading about this memoir the other day! The author of another book I was reading thanked Dani Shapiro for her insights, so I googled her. Nice to know her book's worth a read! Juju at Tales of Whimsy.com - Definitely one in which the author bares her soul! I'd be interested to see what you think of this book if you get a chance to read it. Kathmeista - This would definitely be a book that would be right up your alley, it sounds! Check it out! Connolly-Ahern (Col Reads) - Let me know what you think if you get a chance to read it! Zibilee - I definitely think this would be one for those questioning their faith and where they stand and even for those who feel fully entrenched in their beliefs - it's always a good reminder, I think! Andi - I think this would be a good one to pick up; it definitely encompasses a number of things which would be good for any part of someone's journey. I hope you like it! ham1299 - Thank you so much for the award!! Heather J. @ TLC Book Tours - Thanks so much for including me in the tour! I found it really helped me understand, if not give me more insight into how I should ask certain questions, in order to get the answers that might fulfill me. Definitely, I would recommend it for men and women! Hey, I Want to Read That! - This should go on all memoir wish lists; I hope you like it, too! Danielle - If you read it, let me know! And I can't wait to read your other blog, too!! My other site is thewannabevegan.wordpress.com. I'm not too consistent on it just yet, though - I'm figuring it out as I go. I also wanted to try another blog on the WordPress site to see if I liked that better! I really enjoyed this book as well and I totally agree with your "reference point" comment. I've thought back to this book a lot during the time since I've finished it. I tend to like reading about people's spiritual journey. This one sounds touching and honest. Oh my, I must add this to my memoir collection! Really well done review. I felt so connected to this one that I had a hard time reviewing it. Mine ended up being a commentary of sorts. Glad you enjoyed the book and I have appreciated your thoughts about it.